Should you join the #MBUstorm blogging challenge? Would you start writing a new blog if you had help? Or if you had a competitive incentive? 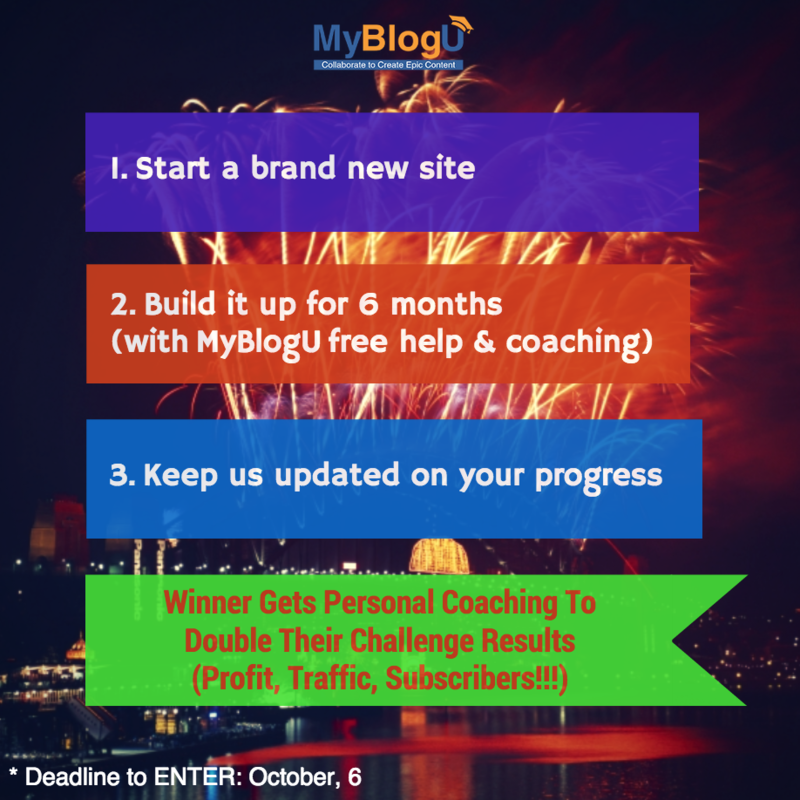 Welcome to the MBUstorm blogging challenge. Have you ever wanted to start a blog from scratch and grow it into a business? It’s the perfect DIY career move for any writer, but blogging is about more than just writing. So help is on its way! 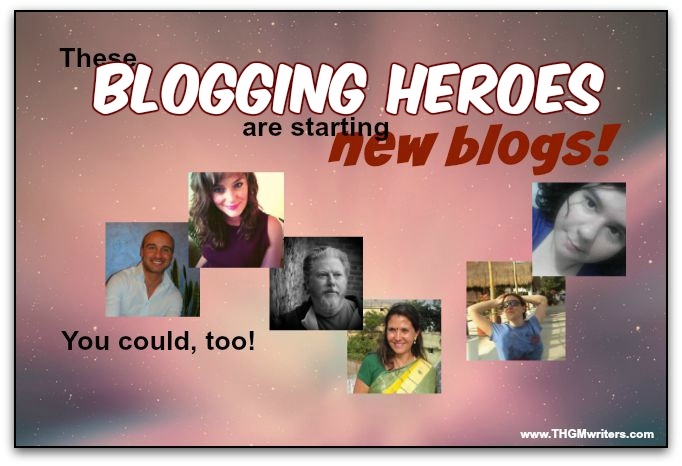 Ann Smarty and her team at MyBlogU are running the MBUstorm Content Zero to Blogging Hero Challenge. It’s a contest – no, it’s a mentoring program. But, wait, it is a contest. But it is also a mentoring program. She has put together a program to help a number of bloggers get started on their first blog or on a new blog, and one of them will win some extra help at the end to boost their revenue. Anybody can join until October 4. You can read all about the MBUstorm Content Zero to Blogging Hero Challenge here. Meanwhile, I’ve caught up with a few of the first bloggers who have signed up so far, and I asked them a few questions about what they are doing in this contest. This is a sneak preview into the minds of several blogger starting up their own new blogs. Lori Hil is a self-professed “Enthused 9-5 Avoider. Chihuahua in lap, coffee in hand.” She’s in this contest to up her blogging game by learning more about creating a niche site called Glowing Skin Care Secrets, which just doesn’t fit well with her other business ventures. Similarly, Kari has been blogging on relationships and happiness (I love reading her posts! ), but wants to branch out into “attracting the life you want through a more positive mindset. I chose it because that’s what I want to implement in my own life.” So her new blog will be Smiling Thoughts. Erik Emanuelli already runs several blogs. He is a self professed social media addict: “But when I’m not working online, I like to jump out of planes.” Similar to Luana’s situation, Erik’s blog on “Everything people need to know to cure an hangover!” has been on his to-do list for some time. He saw the MBUStorm challenge as the perfect opportunity to kick-start the project. He’ll be covering everything from blogging, to computer issues, to social media, to mobile tips. Storytelling and complementary artwork that portray Selina and her adventures in the most detailed and credible way. The advice to Selina’s ‘human readers’ must be spot on and helpful in relation to both Selina’s story and her audience’s real needs. Kari will be focusing on building a subscriber list: “A list that is interested in this niche, and trusts me as someone who has their best interest at heart, is very important for this blog’s success.” Erik will also be focusing on building up his list, as well as optimizing the blog for organic search traffic. Steve’s main focus will be on monetizing the blog either through high traffic volume advertising, or through a paid membership section for access to more details tips and tutorials. Stephanie is counting on “launching it with a big bang!” with a step-by-step guide in hand. But her secret weapon is taking her marketing offline. Seven weeks in India with business cards and a photo slideshow should do the trick! Winning a contest is never easy when everyone is in it to win. Lori will be leveraging her current social media accounts, as well as starting up new ones just for this blog. So it will be easy to follow her progress on her social media accounts. Kari figures that making it personal will be her winning strategy, trying things out and reviewing them for an audience that trusts her to give them the straight goods. Steve is counting on co-authors, as well as guest bloggers, to create a winning team. Luana is counting on originality to win. Erik will be reaching beyond social media and blogging communities to…where? I can’t wait to find out. “Of course, using MyBlogU to its fullest is also a big part of my winning strategy!” Kari points out. “I also wish I had such an opportunity when I was starting a blog: I’d achieve much more!” adds Ann. Let’s cheer them on, and if you’ve been wanting to write your own blog, this is your chance to kick-start it with style! I LOVE the way you put this together David. I’ve started quite a few blogs in my time online. It’s always fun starting a new blog, but when you start a new blog at the same time as a bunch of other people – during a challenge, it is motivating and inspiring at the same time. The bottom line is that everyone who has the thought of starting something new will definitely benefit from this challenge! MBUStorm is an amazing opportunity for both experienced and young bloggers. I totally recommend it! Thanks for putting this together, David! LOVE to see all of us developing those sites into something awesome! Thanks for the add and putting this together David! I cannot wait to see everyone’s progress and know we will all have wonderful blogs out of the challenge! I wish I had #MBUStorm contest when I started my first blog 5 years ago. Thanks for including me, David. It’s awesome to read all the participants and their projects. What a neat idea for a competition! Running my existing business is going to hold me back from participating, but I’d love to see what these folks come up with in six months! Hey, seems like you’ve got a few blogs… which are the main ones I should be following? What a great contest so far. I have entered as a contestant and can only rave about the support I am getting from the group. The opportunity to have experts helping to guide the process of developing a new site from scratch is unheard of. Through this contest the MyBlogU team helps promote best practices from the inception of a site. This limits the opportunity for contestants to pick up bad habits early on. Thank you for recognizing the value of the contest David and thanks to MyBlogU for setting it up! I am definitely going to cheer them on! Goodluck to each and everyone of them! The #MBUSTORM blogging challenge is new to me and the concept is appealing. I see that newbies and wanting to start a new blog can take advantage of the challenge to blog. If am to do this, then I will stick with a passionate niche, grow subscriber list and build a community. But, I don’t have that in my plans for now. Once again, Good luck to the bloggers who have shown their interests already! I think it’s a smart idea, and Ann Smarty is one sharp cookie! Your layout of the information is excellent, by the way, and I will be following this competition. Kim Roach is doing something similar, and it’s a blog start up 30-day challenge… But I don’t think there’s free coaching associated with a “winner” – so this is a neat concept. Hey David! Very nice to meet you and thank you for including us! 🙂 Yup, Luana and I are a good team so far (on the slow side). Hope to meet more great humans like yourself over the course of my blogging activities! I wish i had of seen this when it was curent. But fear not, i will be taking some of the ideas above and putting them to work. Thanks so much.. Being a blogger has its challenges.. And isolation is one of them. Competitions like this can bring people together..